A great new exhibit opened on Friday at The Museum at FIT, juxtaposing, for the first time in a full exhibit, the work of YSL and Halston. 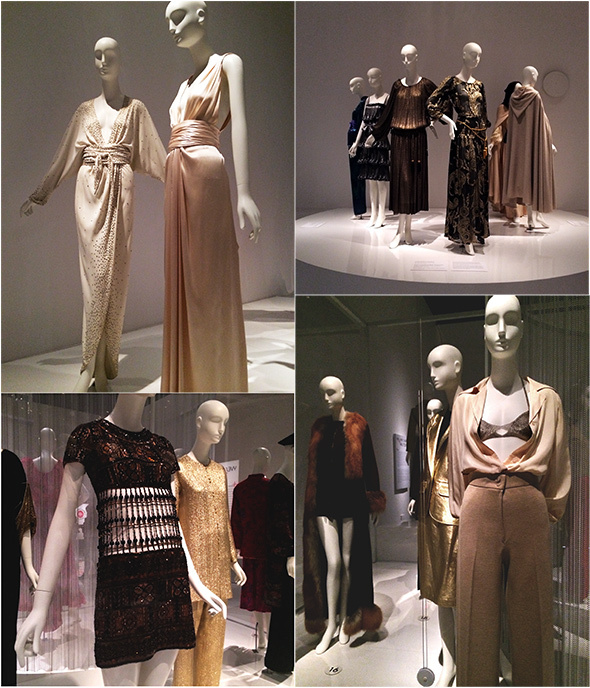 It’s an extremely timely exhibit, considering fashion’s current love affair with all things 70′s. What makes this exhibit exciting to experience is how similar the work of these two designers actually is. It almost became a game I was playing with myself to guess which design was Halston, and which was YSL. “This one’s DEFINITELY Halston,” one friend would say to another. The friend would stand by the descriptions off to the side and quip back, “…it’s YSL”. It’s a beautiful exhibit, and a fun game to play. Goodness, everything looks so pretty & intricately made. Thank you for the update. I am going. YSL and Halston, a wonderful combination! FIT has fabulous exhibits and you do not have to travel uptown, haha! I love it all! Wish to see it in person! Great to see the 70s being referenced in current collections, it was my era and I believe a great one. We mined the archives and fell in love with vintage while giving it all a modern edge. Would love to see this exhibition travel to Australia. I am gonna see it, I can promise you that. I love the simple silk shirt tucked into high waisted trousers (bottom right). Perfectly louche. Great Exhibit and I also enjoy seeing Givenchy in madrid, did you got the opportunity? I want to see this! I love that era.